A halter that fits your horse well and has safe hardware.- A good nylon, leather, or rope halter will work. This would be your everyday halter. A lead rope that is comfortable for leading your horse and works well for tying up.-does not have to be very long but needs to be sturdy. This would be your everyday lead rope. A training halter and longer rope-A strong nylon halter, or rope halter works well. The study training rope should be at least 10 feet long. These tools would be used for ground work . A longe line-needs to have safe hardware and can be used with your training halter. This will be what you use to lunge your horse. Grooming supplies, you should have a curry comb, dandy brush, face brush, mane and tail comb, and a hoof pick at the least. These Important tools are needed to properly groom a horse. A grooming tote-A tote that is large enough for your grooming supplies and is comfortable to carry.This will make it easier to keep your grooming supplies together and store them and carry them where you need to. A longe whip. A long whip that is comfortable for you to hold. This is used to encourage forward movement when longing. A soft comfortable saddle pad or blanket.-Needs to be off good quality and fit your horse and saddle well. A well-fitted bridle-Needs to fit well, match you discipline, and be of good quality. This will be your bridle you use for everyday riding. A change of bits.-It is a good idea to have a couple different bits then team one you have on your bridle. This way you can change them to make your horse more responsive, or more comfortable. Sometimes when you are teaching a horse something new, a different bit will help. A riding crop-A small whip that is comfortable to hold while riding. This allows you to refine your cues while riding your horse. A riding helmet-A well fitted helmet that is comfortable to wear for everyday riding is an essential piece of tack. A saddle rack-It is important to keep your saddle of the ground and supported. 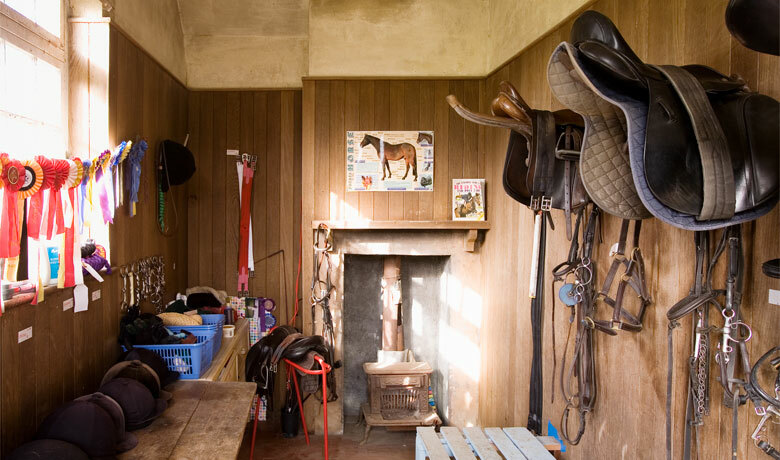 A bridle hook-To hang your bridle so it keeps it’s shape and stays in good condition. Shelving-To hold your grooming supplies and other equipment.